Update: As the Zimmerman’s camp calls for patience, one wonders where Zimmerman’s patience was on the night he cornered (and probably threatened if not enraged) Trayvon? If you have been advised to not approach the subject, but you do, you then become an aggressive participant in an unknown matter. Your level of training may not be vast enough to prepare you for unknown events. You certainly are not in a situation that requires immediate action. You are in a safe position to watch and wait for assistance. Unless you are trying to stop great bodily harm to yourself or others, you have time and distance to choose differently. Now we have a person who saw a kid he thought was suspicious – for what? Do we know? He decides (after being advised not to) to approach a person in the dark out of sight that he said was suspicious. And do what? Did he say something to the person that was threatening or fearful — so intimidating that it would frighten you and make you fear for your life in an isolated dark area where no one else could see you? Was that person so aggressive that it scared you to a mode of defense? With so many robberies, murders, abductions going on today, may be the kid felt for his life, maybe he thought this guy was trying to do him bodily harm. Maybe he was right. But we won’t know, because he has no voice. He is dead, and everyone knows dead men tell no tales. Since when does the aggressor get to call it self-defense when the so-called perpetrator is moving away from them and not to them? You’re a 17 year old kid visiting with your Dad’s fiance’. You went to the nearby 7-Eleven to get some candy and drink at night. On the way back some yahoo in a pick up truck starts shadowing you. You’re in a strange town and some guy finally stops his truck and follows you on foot. You duck away, but you don’t know your way around. You just need to get home. But you are also a 17 year football player, used to physical encounters. And as most 17 year olds, you are dangerously fearless. Worse yet, you are talking to you girlfriend on the phone and now is not the time to be timid. Now switch shoes. You are an egotistical 28 year old playing sheriff. You see someone in your neighborhood and you jump to conclusions based purely on stereotypes. You stalk a 17 year old kid at night, first by car and then on foot. You are king of this little pond, and you are armed. You too are fearless in a dangerous way. So who is the victim here? Who is being ‘hunted’? Not the kid with the candy and soda – he is talking to his girlfriend with no intention of an altercation. He is not pushing for confrontation, he is not looking to show his manhood. Zimmerman was on his way to the grocery store when he spotted Trayvon walking through his gated community. Zimmerman called police and reported a suspicious person, describing Trayvon as black, acting strangely and perhaps on drugs. Notice how Zimmerman, from a distance, had already tried and judged Trayvon. How strange was Trayvon walking, drinking his soda and talking on his cell phone? Good lord, what is Zimmerman’s definition of ‘acting strangely’? One thing we do know, Zimmerman was an obsessive vigilante type who loved to play sheriff. Zimmerman got out of his SUV to follow Trayvon on foot. When a dispatch employee asked Zimmerman if he was following the 17-year-old, Zimmerman said yes. The dispatcher told Zimmerman he did not need to do that. There is about a one-minute gap during which police say they’re not sure what happened. Zimmerman told them he lost sight of Trayvon and was walking back to his SUV when Trayvon approached him from the left rear, and they exchanged words. Trayvon asked Zimmerman if he had a problem. Zimmerman said no and reached for his cell phone, he told police. Ahh. They exchanged words. Words like “I am visiting in the neighborhood” or “Just went to the 7-Eleven”. Or how about words from Zimmerman accusing Trayvon while being derogatory? You think Zimmerman simply said ‘no’? When he finally gets to be the big bad sheriff in town? Zimmerman’s last chance to back off. He could have said “was just checking” or “OK kid, just get home safe”. 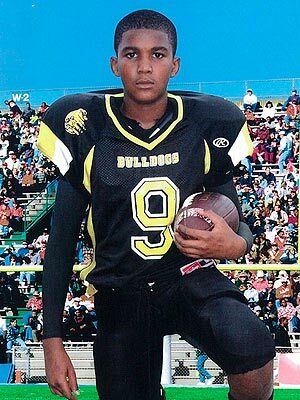 If Trayvon hauled off and hit Zimmerman in the nose, it was because Zimmerman was being a jerk. And I hate to tell this to Zimmerman, but if you cause a fight with words you cannot later claim self defense. Since words were exchanged there was no attack. Zimmerman was the one pushing for the confrontation. To the point he left is truck on foot with a loaded gun. Trayvon, loaded with Skittles, never stood a chance. You want to know why Zimmerman is all teary and upset. He is just now coming to grips with what he did, and how instead of being a sheriff he is just a child killer. He knows he could have avoided all this many times over. And it is about time he did what is right and truly courageous – and admit it. Layman, give the man a silver penny. You are correct. If that were the case, he would have been in Miami and he would have been down the street from his mother’s house, not walking down the street hundreds of miles away from home in a gated community. The whole “Zimmerman doesn’t deserve a trial, hang him now” crowd wants to portray him with all the evil ways, thoughts, plans, and activities. is it just a little bit possible that Martin was not where he was supposed to be when he was supposed to be there and therefore he might not have been 100% innocent in all his activities. just a little bit? Those questions you ask about Zimmerman are no more relevant to the case than the question I asked.